Below is a look at the popularity (based on Google search volume) of Tim Tebow since the end of the NFL lockout in July. The first thing you will notice is that after the Denver Broncos playoff run, Tebow is now more popular on the internet than Jesus. But if you look closer, you can see an even more telling trend. As Tebow’s popularity has increased, so has that of Jesus. And everytime we see a peak in Tebow’s popularity, we also see a peak in the popularity of Jesus. 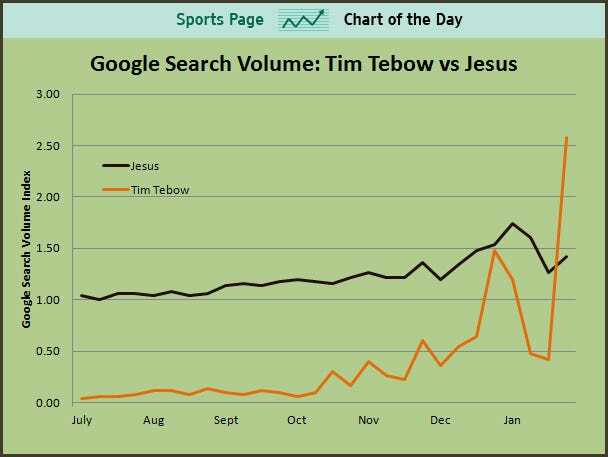 In fact, since the onset of Tebowmania, the popularity of searches for Jesus on Google have increased by approximately 50 percent. No matter what anybody thinks of Tebow, it cannot be denied that he is one of those rare athletes that transcends sports. Did LeBron James Take A Subtle Jab At Nike’s Rival Shoe Company Last Night? Procter & Gamble has agreed to never again run an ad for its CoverGirl mascara because it used “enhanced post-production” and “photoshopping” to make eyelashes look thicker than they were in real life. 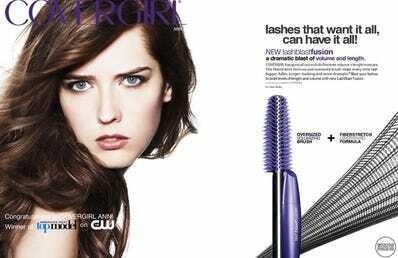 P&G agreed to the ban even though it disclosed in the ad that the image was enhanced. The move is the latest in a series of baby steps that U.S. and international advertising regulators have taken to ban the use of Photoshop in advertising when it is misleading to consumers. The company’s decision was described in a ruling by the National Advertising Division, the U.S. industry watchdog that imposes self-regulation on the advertising business. NAD is part of the Council of Better Business Bureaus. Its rulings are respected and followed by most advertisers because it enjoys a close relationship with the FTC, from which it has historically drawn some of its senior staff. Recalcitrant advertisers who refuse to withdraw or amend misleading ads are referred by the NAD to the FTC, which has the power to fine, sue or bring injunctions against companies. The U.K. ruling found the use of photo retouching misleading per se. In the U.S., the FTC has has also tightened rules to hold celebrities accountable if they make claims in ads they know cannot be true. And in France, in 2009, 50 politicians asked for health warnings to be imposed on fashion ads if they showed retouched models’ bodies. Bing search volume continues to drop despite tons of ads and cheating — redirecting traffic from live.com, msn.com, microsoft.com, and windows search (see also – http://bit.ly/7qDBEz) . 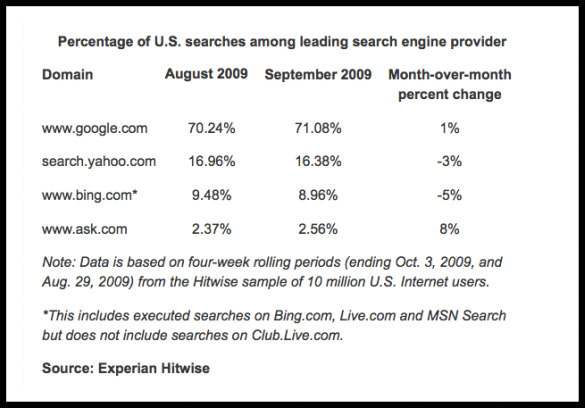 The Nielsen Company today reported December 2009 data for the top U.S. Search Providers. MegaView Search data – including total searches, unique searchers, search share, and all other search figures – cannot be trended with search results prior to October 2009 due to recent methodology changes. 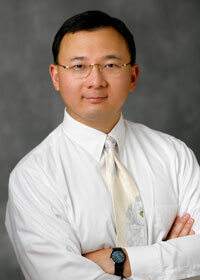 Searches represent the total number of queries conducted at the provider. Example: An estimated 6.7 billion search queries were conducted at Google Search, representing 67.3 percent of all search queries conducted during the given time period. Facebook is going down – pageviews, average stay, pages per visit – why? From the Compete charts below, it is clear that Facebook is seeing a decline in pageviews, average stay, and pages per visit. But why? I know that I have reduced the time I spend on Facebook and I have also reduced the number of messages and other social actions as well. And I have deleted virtually all of my personal and family photos and will not upload any more. These may be the first signs of a waning of Facebook due to a number of factors. For example, Facebook has stated that it will not participate in OpenSocial because they do not want people to be able to export their content, conversations, photos, etc, out of Facebook and use on another social network. I am concerned that I will not be able to retrieve or back up content which I believe is mine. I like to have control over my family photos, conversations with friends, etc. I am willing to accept as a “cost” of using the Facebook system the fact that they know who my friends are. But I am less willing or unwilling to continue putting my content where I cannot get it back, in its entirety. (Google Docs, for example, just launched a feature where you can back up everything back out of Google Docs into Microsoft Office formats). A second issue mentioned in a previous post is the increase in advertising on Facebook and also the more unscrupulous practice of injecting ads “into the stream” — ads masquerading as status updates. These are harmful to the overall trust built up in the community and I have un-friended quite a few people whose accounts were clearly used to promote events, products, etc. From a prior post – http://bit.ly/EhiW9 – Facebook advertising metric are absolutely abysmal. They keep trying to sell advertisers on the hundreds of billions of pageviews they throw off. But advertisers are getting smarter and more and more of them will buy ads on a cost-per-click basis (instead of CPM, cost per thousand impressions basis). This means that the ad revenues that Facebook enjoyed from gross INefficiencies will be decimated. Bed Bath and Beyond is blocking RetailMeNot — possibly because their blended average margin is relatively low and it cannot afford giving “expensive” coupons to everyone. Retailmenot.com started later than Dealcatcher, but quickly overtook them and continues to increase — it is simply more useful because of real time consumer feedback on whether the coupons/codes worked or not.